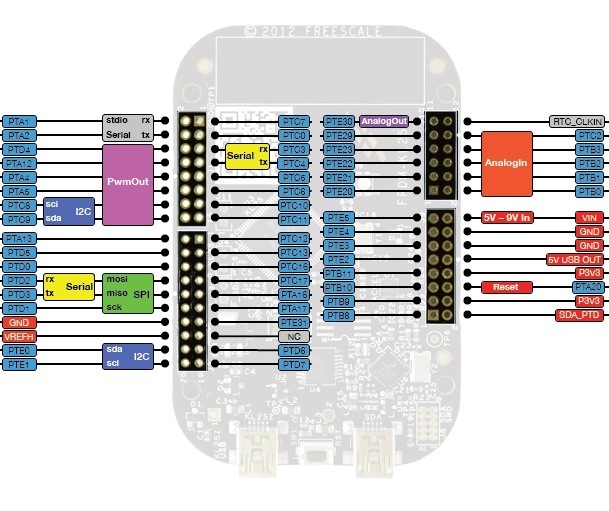 Hi, Recently i connected my wild thumper controller (arduino) to my andriod phone via bluetooth and now my lecturer says I should connect the bluetooth serial to an FRDM-KL25Z which will send data to the arduino. Please does anyone have a simple mbed code to receive data from a bluetooth serial and transmit it?? here is a link to pin configs of the FRDM-KL25Z if needed http://mbed.org/media/uploads/rikabel/kl25z-pinout-revised.jpg . Also, are the rx/tx pins on the FRDM-KL25Z operating at the same voltage as the rx/tx pins on my wild thumper controller? Thanks for the help. /media/uploads/kosidinma/mbed.c Ok so i managed to write up a code but i have no idea if its correct (i can't test it because my FRDM-KL25Z isn't here yet). Please can someone check it and see if its correct? Thanks. You can compile your code, even without a board. Once it arrives, just flash it. Happy coding! Anyway I guess it is something like: "Expected a ';'". Your last line of regular code lacks a ;. Btw you should take into account the KL25 is not 5V tolerant, you may not put I/O voltages above 3.3V on it.